Dance Location Mountain Mixers dance at the Recreation Hall in Linville Land Harbor. 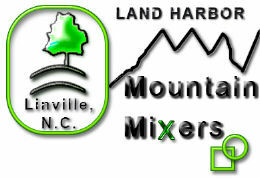 Linville Land Harbor is located on Highway 221 between Pineola, NC and Linville, NC. Enter the main entrance, turn right around the lake, Look for the large building on the left, this is the Recreation Hall. Enter the rear, left entrance. Dance is every Sunday between tips by recorded music.